With all the fuss currently being generated over the cinematic adaptation of C.S. Lewis’ The Chronicles of Narnia: The Lion, the Witch and the Wardrobe (2005), now is the perfect time to reappraise Japanese animation master Hayao Miyazaki’s magical world of My Neighbor Totoro (Tonari no Totoro — the pronunciation puts an emphasis on the first syllable; “TOH-toro” - 1988). Both works were created with children in mind and have fantasy and magic, and in Lewis’ creation a lion helps transport the children while in Miyazaki’s work a giant cat that is also a bus does the magic carpet honors. But the most fascinating comparison lies in their differences rather than their similarities for one is a perfect representation of Western thought and Christian ideology, while the other stands in for a humanist model with subtle nods to Shintoism, the native religion of Japan that includes elements of nature and ancestor worship. There are also a few cues that reference Buddhism, Japan’s other major religion. My Neighbor Totoro is the story of two young girls, Satsuki and Mei Kusakabe, ages ten and four, respectively, who accompany their father, an archaeology professor, as he moves to a house in a farming community near Tokorozawa City sometime in 1955, which is now a suburb of Tokyo (and where Miyazaki lives). The reason for the move is so that the Kusakabe family can be near the mother who is convalescing in the city’s Hachikokuyama Hospital for an unnamed illness (the hospital, in real life, was known as specializing in tuberculosis). The novelized version of the film states that the mother suffered from tuberculosis and another hint is that the house that the Kusakabe family moves into was built by a wealthy man whose wife suffered from tuberculosis and died, thus explaining why this house was a bit more modern than the village homes that surrounded it. This is the most autobiographical element of the film because it relates to Miyazaki’s mother. “Mrs. Miyazaki suffered from spinal tuberculosis. She was bedridden from 1947, two years after the birth of her fourth child, to 1955. The first few years of her illness were spent largely in the hospital, but she was able to be nursed at home thereafter and lived to old age.” (Helen McCarthy, Hayao Miyazaki: Master of Japanese Animation). As Satsuki and Mei explore their new home the audience gets a taste of mystery and magic with the introduction of small, shadowy, black creatures that are first referred to as “dust bunnies” and then “traveling soot.” Later, when Mei tumbles down an enchanted garden path (echoing the rabbit hole in Lewis Carroll’s Alice in Wonderland), she meets a giant and fuzzy forest creature that she dubs “Totoro.” This is a play on Mei’s mispronouncing “tororu,” the Japanese word for “troll.” And, although the huge raccoon-like creature with a Cheshire-cat grin has an ominous roar it, like the dust bunnies, is ultimately a benign creature. We will ultimately meet three Totoros; Oh-Totoro (in Japanese “Oh” means “large,” but U.S. translations dubbed him “King Totoro), Chuu-Totoro (which means “medium”), and Chibi-Totoro (which means “small”). The smaller Totoro’s are marginal, leaving Oh-Totoro to steal the show and, in Japan, where this film ended up becoming one of the greatest merchandising successes of their cinematic history, when people talk of the Totoro that adorns everything from their tote bags to t-shirts and so on, they are referring to Oh-Totoro. The Totoros are Miyazaki’s invention, and he has referred to them as “nature spirits” while simultaneously denying any religious connotations choosing instead to focus on his work as inhabiting a children’s world, where only children can see the Totoros and the other forest spirits. Nonetheless, Shintoism and Buddhism are part of the landscape and, more importantly, inform the pace of the film itself ? which is exactly where some film critics stumble. 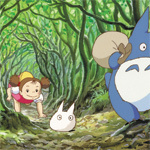 Peter Stack of the San Francisco Chronicle refers to the film as being “a little pokey at times,” while Gene Siskel originally said “it really bored me.” Siskel would later change his assessment after seeing the film with a crowd of children, but nonetheless these criticisms point out something about My Neighbor Totoro that differentiates it from Disney productions or most American films; it is populated by nice people, benign forest creatures, and is centered on a loving and caring family. Although even the word “centered” is misleading because nature itself could be said to be the real center (or circle whose circumference is nowhere, to be exact). Which is to say that while seeing Oh-Totoro enjoy raindrops or the wildly imaginative Catbus are showstoppers, in My Neighbor Totoro the viewer can also take great pleasure in simply soaking in the natural backdrops. While the forest spirits and the humans are rendered as hyper expressive, everything that surrounds them, from light-dappled tree-groves to the marvelous clouds, echo beautifully the real density and lusciousness of nature. Signs of nature worship, an aspect of Shintoism, can be seen in details such as the Shimenawa rice straw and paper ribbon rope on Totoro’s tree, which signify that it’s sacred. Viewers can also spot an abandoned Shinto shrine under the camphor tree and, at the entrance to a hill, a Torii Shinto shrine gate. Also enhancing the naturalistic components of the film is Joe Hisaishi’s work on the soundtrack. “Hisaishi’s score also demonstrates that he understands the power of silence, a much neglected element in contemporary Western cinema. The whole soundtrack is well planned in this regard. The relationship of natural background sounds, such as wind and the chirping of crickets, dialogue, and music, is perfectly balanced to enhance the imagery.” (Helen McCarthy, Hayao Miyazaki: Master of Japanese Animation). On the Buddhist front there are a couple of instances where Ojizou-sama statues can be seen. Ojizou-sama is a patron deity of children in Buddhism and they are often erected as roadside memorials in memory of children who have died. Satsuki and Mei bow to the statues when they ask for permission to stay with them during a rainstorm, and they can be seen again when Mei is lost. In the latter case the presence of the statues can be understood by Japanese audiences as a sign that she’s going to be okay. The celebration of nature and the gentle spirit that guides My Neighbor Totoro is even hinted at in the title, since the Totoro represents nature and it implies the need for co-existence. In other words, it’s the exact opposite of Manifest Destiny, or the subversion of nature, and it does away entirely with the narrative formula that paints things in black and white and in an “us” versus “them” mentality; which is what most Western cinema purveys in order to seduce audiences with a fast pace and a quick allegiance to the main protagonist. Ironically, despite the fact that My Neighbor Totoro is so well adjusted and nurturing, its release in the U.S. was held up due to a few scenes, including one wherein Satsuki shares a bathtub with her father. U.S. companies felt uncomfortable with the images, feeling that Western audiences wouldn’t understand that traditional Japanese homes often had various tubs, washing in one before sharing a hot bathtub together. Meanwhile, Miyazaki was uncomfortable with giving any outside company the right to make edits of any sort, since he felt that the cuts and changes made to his film Nausicaa of the Valley of the Winds (Kaze no Tani no Naushika, 1984), which was then released in the U.S. as Warriors of the Wind in 1986, were so destructive that further U.S. releases were postponed for a long time thereafter. My Neighbor Totoro was released in Japan in 1988 as part of a very unusual package alongside Isao Takahata’s Grave of the Fireflies (Hotaru no haka), which was a very different animation experience based on the semiautobiographical work of a World War II survivor. The reason for this gambit was due to the fact that My Neighbor Totoro was considered too much of an investment risk on its own, but since Grave of the Fireflies was adapted from a well-known novel the filmmakers knew schools across the country could be counted on to encourage attendance based on its educational value. Although My Neighbor Totoro did not quite break even upon its theatrical release, it did put a foot in the door and give Miyazaki’s Studio Ghibli (pronounced ji-bu-ri, and the name for both an Italian fighter plane and a hot Saharan wind) the means to establish itself. Of course, the merchandising juggernaut that came soon afterwards helped too. Miyazaki made huge inroads with Western audiences with Princess Mononoke (Mononoke Hime, 1997), Spirited Away (Sen to Chihiro no Kamikakushi, 2001), and Howl’s Moving Castle (Hauru no ugoku shiro, 2004). Princess Mononoke became the biggest grossing film in Japan until it was unseated by an American behemoth about a sinking ship. Spirited Away won an Academy Award for Best Animated Feature in 2003. But Miyazaki’s legacy extends far beyond these recent blockbusters. Born in 1941, he started his career in 1963 as an animator at the Toei Douga studio and from there would go on to add screenwriting, directing, and producing to his credits. He has worked on about 25 projects and is a master of cel animation (where images on paper are transferred to cel via heat treatment, then colored with water-based paint and filmed with the background). His father was passionate about cinema and he remembers seeing films by Yasujiro Ozu, Vittorio De Sica, Andrzej Wajda, and Robert Bresson. But it was the heroine of Japan’s first feature-length animation, The Legend of White Snake (Hakuja den, 1958), that stole his heart and made him want to bring that same experience to a new generation of children. And as more and more parents come across such gems as My Neighbor Totoro they’ll see why Ebert puts it on his shortlist for kids. They might also be interested to know that, on top of Ebert’s endorsement, no less an authority on cinema than Akira Kurosawa (1910-1998) made it one of the few Japanese films that he placed on his list of the hundred best movies of all time. Cast: Noriko Hidaka (Satsuki), Chika Sakamoto (Mei), Shigesato Itoi (Tatsuo Kusakabe), Sumi Shimamoto (Yasuko Kusakabe), Tanie Kitabayashi (Kanta no obasan), Hitoshi Takagi (Totoro). Cast: Dakota Fanning (Satsuki), Elle Fanning (Mei), Lea Salonga (Satsuki & Mei’s Mom), Timothy Daly (Satsuki & Mei’s Dad), Frank Welker (Totoro).